Recently, there has been a lot of talk about increased domestic oil production and American energy independence. The two are not the same. Drilling in the U.S. will not insulate Americans from the long-term upward trend the global price of oil due to growing demand in the developing world. Nor will increased domestic production make us less vulnerable to dramatic price swings following geopolitical events and natural disasters. Unless the U.S. were to nationalize its oil companies (and I don’t believe the drill-everywhere lobby is also advocating for a state-run economy), gasoline prices will still be set by global forces we cannot control. Thankfully, we have other options, namely driving cars and trucks that use less gas to go the same distance, or have the ability to run on cleaner alternative fuels, such as electricity, the price of which is much cheaper and more stable than that of gasoline. 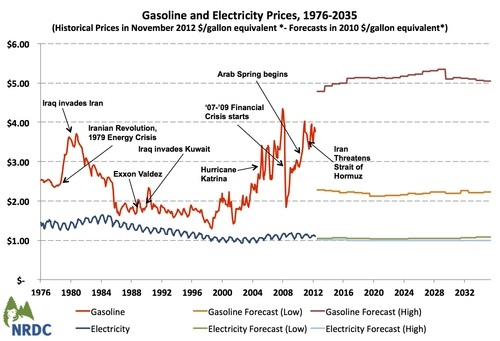 The chart below contrasts the historical and forecasted prices of U.S. gasoline and residential electricity in dollars per gallon equivalent, adjusted for inflation. *Equivalent price for a 27 mile-per-gallon conventional vehicle and a plug-in electric vehicle with 0.34 kilowatt-hour-per-mile efficiency. Data source: Energy Information Administration. The wild fluctuations in the red line represent the price of a gallon of gasoline and make it painfully obvious that no one regulates the world oil market. Likewise, the huge disparity between the Energy Information Agency’s high and low forecasts for the future price of gasoline underscores the risk inherent in perpetuating our dependence on oil. In contrast, the price of residential electricity follows a predictable seasonal pattern, never deviating far from the buck-a-gallon equivalent mark. Even better, there’s virtually no difference between the high and low forecasted electricity prices, with both sticking right at the dollar-a-gallon mark. The price of electricity is more stable because electricity is made from a diverse supply of resources and is carefully regulated by state public utility commissions. Drilling and fracking everywhere will do little to help Americans at the pump. The only way to break our addiction to oil is to break our addiction to oil. Thankfully, there’s historical precedent showing this can be done. 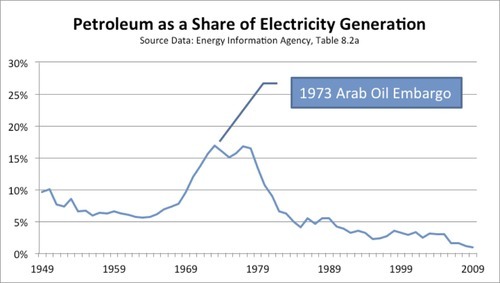 Before the 1973 Arab Oil Embargo, almost 20 percent of our nation’s electricity was generated from petroleum. After a concerted effort by the electricity industry to get off oil, that share is now less than one percent.